That is the way it is with icons: often they are judged by what they represent rather than by their actions. This was the case for Barack Obama, honoured with the Nobel Peace Prize for the simple reason that he was the first black American elected President of the Unites States. It is the same in the case of Angel Merkel who took over the so-called torch as leader of the free world when Obama visited Europe. And while she was at it she took advantage to declare herself a candidate for a fourth mandate as Chancellor. Sixteen years! Is this prospect worthy of so much praise? Obama leaves a less secure world and is handing the United States over to Donald Trump: undoubtedly an inventory is necessary. The same goes for the German Chancellor who has been in power or twelve years and cannot escape responsibility for the situation in Europe. The latter is in ruins and Merkel looks more like a ‘Trümmerfrau’, one of those ‘Mother Courage’ women working through the rubble of Berlin, alone, in 1945, rather than the architect of a nation. So we expect at least a project for the future. The first Chancellor of the Federal Republic, Konrad Adenauer, obtained a last minute reprieve to seal the Franco-German reconciliation with Charles de Gaulle in 1962-1963. Helmut Kohl ruled a mandate too far before being beaten in 1998 but he put it to use to launch the Euro and bring about the unity of Europe after the reunification of Germany. Mrs Merkel proposes being an anchor of stability in a world that is breaking up. In announcing her decision to run again she fed the myth of the reflective scientist: ‘I need time. Decisions fall late but I stand by them’. Another reading is possible, that of a politician who yields nothing in ideology or tactics before being forced to give up everything suddenly in order to avoid disaster. The litany of her swerves is well known. In 2008, after the bankruptcy of Lehman Brothers, Merkel was ready to provoke a new disaster by letting the Hypo Real Estate Bank fail. Her moralistic approach to the bankruptcy Of Greece accelerated the Euro crisis. In 2011, after the Fukushima disaster she decided in the course of one evening that Germany would abandon nuclear power. 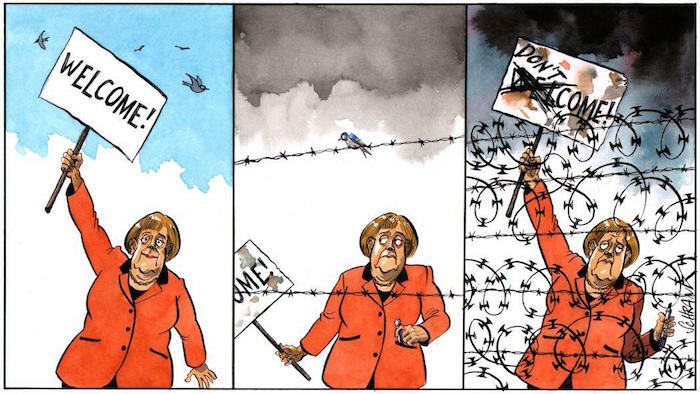 And in 2015 she opened the door to immigrants without consultation and without concern for the consequences of her decision on Germany’s partners. In short, Merkel is respected because she is boss of the continent’s most powerful economy, and certainly not for her ability to set the way forward if it is other than the ineffective moralistic course that Germany alone is in a position to hold. 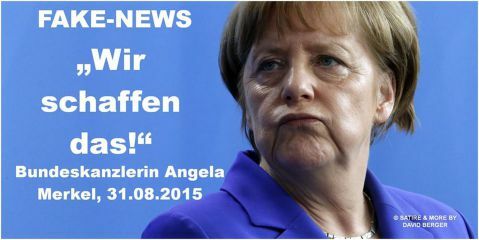 But in today’s situation doing nothing means just sinking, and Merkel has nothing or very little to offer. She is Chancellor of the ‘frozen conflicts’ for lack of courage pr the political capital to tackle them. Merkel has let the North-south division of Europe develop between winners and losers in the Euro system. She has accelerated the East-West division with eastern countries refusing to welcome immigrants while those in the west are open to multiculturalism. Her lone anti-nuclear ride has shattered all energy policy and turned the EU into a bad student of climate. She has taken part in the denunciation of the democratic deficit in Europe but paid it little attention. By controlling the main parliamentary group in Strasburg she has succeeded in imposing German views in Europe. She has made gargling noises over war and peace but always finds a pretext for not intervening at the sharp end. She speaks as a symbol to her parishioners only indirectly through the Bundestag and she does not deign to give an interview to the French media on the centenary of the Verdun slaughter. This way of doing things would have some resonance if Merkel’s Germany were not extraordinarily prosperous and its partners were not particularly mediocre. She is deaf to all critics because Germany is indeed the most virtuous, on finance, refugees or the democratic process. Germany is doing so well that she has become a navel-gazer and does not see the ambivalent consequences of her policies, good at home, too often devastating among Germany’s neighbours. And her sense of cultural superiority makes her unable to understand that the world of Athens, Madrid or Paris does not work like Berlin. She does not understand that Germany’s external surplus, above 8% of its GDP, is not only an attribute but also, in a world without devaluation, a poison that will eventually destroy the Euro. The most critical compare her to the Pharisee in the Gospel of Luke (18: 9-14) who boasts of his superiority over the tax collector: ‘O God, I thank you that I am not like other people, thieves, rogues, adulterers or even like this tax collector’. As we know the Gospel humbles the Pharisee and exalts the tax collector because he shows humility (this is not really true in the case of non-German Europeans). There is no need to seek God’s judgement. It would be possible to solve the problem if Germany accepted its role as a benevolent leader, if it succeeded in admitting the problems of others in its domestic policies. The Germans play the fake innocent by explaining that their history forbids them from taking responsibility. But Helmut Kohl did so; he was careful to support the small countries in the 1990s rejoicing in the fact that Germany was for the first time at peace with its neighbours; and he abandoned the Deutschmark because its superiority would eventually lead to a revolt by Germany’s neighbours and would thus be detrimental to Germany in the long term. German policy now is squandering this rock-solid practice. In this setting is Mrs Merkel the right person who can save Europe and solve the frozen conflicts? It is feared the answer lies in reversing Obama’s slogan: ‘No! She can’t’.